← Cider Tasting at Roanoke Vineyards POSTPONED!! Photo from Lenn Thompson, I lost my picture. The other day while walking around a wine shop near my office, I noticed this bottle and I had to look twice. Did it really say 2008? Was that a typo? How could a 2008 Red wine be out already when some places did not release some of their 2007’s yet. After doing a quick search on my blackberry, I found out that it is not a misprint it is on Bedell Cellars’ Website. So then my next question came up; How does a 2008 red get released when there are still some 2007 reds that have not been released? I needed to take this home and taste and do some undertaking. According to Bedell Cellars website, this wine goes through carbonic maceration. Carbonic Maceration is a processes that is very common is some young vines. AS is the case here. The process is started when who grape clusters are fermented in a carbon dioxide environment before they are pressed and or crushed. In other words, the juice is fermented inside the berry. The result is a very fruity wine with little or no tannins. A perfect example would be Beaujolais Nouveau. This Bedell Cellars 2008 First Crush is a blend of 72% Merlot and 28% Cabernet Franc. It was fermented in stainless steel. Retail is $18. Now on to the tasting; on the nose I was picking up loads of cherry, raspberry, plumb, cedar and dried herbs. I was also picking up a bit of fermenting grapes in the glass when I first opened. Something that reminded me of walking through a wine cellar. I like that part of the wine the best. The taste was more of the same. Cherry, Raspberry and plum. I was picking up some grape skin and a little smoke. There was lot of acidity and I found this to be palate cleansing. The finish was nice, though short I was picking up some dark chocolate at the end. In conclusion, I loved this wine. It had feelings of being in a vineyard at harvest season, tasting the grapes off the vine and the smell of the juice being crushed and fermented, aroma’s I love. It was alot of fun and went perfectly with he hamburgers I was grilling that night. It was a great value at $12.95 too! I recommend you pick this up at your wine shop if you see it, if not pick up some the next time you are out on the east end. 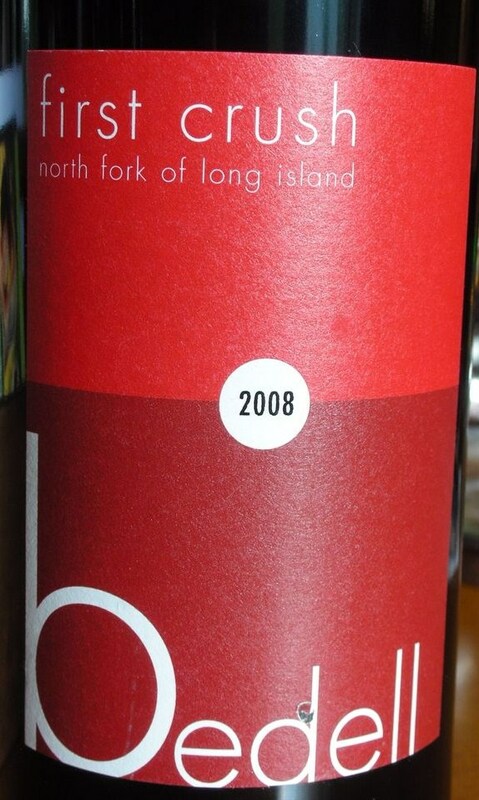 This entry was posted in 2008, Bedell, Blended Wine, Long Island, Wine Store. Bookmark the permalink. Regardless of the merits of the wine, I have to say that this policy of charging a retail price of $18 and a 20-30% discounted price to the rest of the planet kind of rubs me the wrong way. Nobody plays this game more than Bedell. I love their wines, was in their wine club, but when I discovered I was getting my wine at the 20% discounted club price(this $18 bottle would be 14.40 plus shipping to my house) and non club members were getting this same bottle, like you, for $12.95 at the retailer, I felt a little like my support was being taken for granted. Thanks for commeting, I have to agree with Casey on this, I recently saw an Estate Merlot priced at $13.95 when I know it is $25 in the tasting room. The important thing is tha you see it in your wine shop! This isn’t the fault of the winery – if a wine shop buys the wine they are entitled to sell the wine at whatever price they want. this is not an uncommon thing to see in the industry. Casey, you are right. Just the other day I aw an Estate Merlot priced at $13.95 and I know that it sells for around $25. Thanks for reading and thanks for posting a comment! It does seem to me (my anecdotal experience) that Bedell consistently has the biggest discount at the retailers vs. the price they sell at the tasting room. Don’t get me wrong I love their wines but just feel that the pricing at the vineyard is so consistently out of whack with other outlets that it didn’t make sense that I join their club because most retailers seem to have the wines at a 20% discount even to the club prices. I continue to enjoy their wines through my local retailer. I do see what you are saying, and it makes perfect sence. I owuld probably do tha tsame as you if I saw that. It fustrated me when I saw that wine for $ 12 off the tasting room price! I enjoy buying wines from my local shops becuas I look at it this way, I am supportin my community, my local wine merchant and the vineyard I am buying it from. Being a member of a wine club does have its benefits, like special releasesa and special events and special tastings that are discounted or free. Bottom line is this, drink local! Especially the wines you like and love. Glad you can get Bedell at your shop, they seem to be limited at mine. I definitely agree with you, Michael, and I guess I am being a bit unfair to Bedell or any others who have clubs because I haven’t taken into account that many locals who are in the clubs may pop in more often for tastings, etc, because they are local. I live 200 miles away and rarely get in for the events. There is a cost associated with those events and tastings that naturally have to be built into the cost of the memberships I guess, but it doesn’t make sense for me where I am located to necessarily join some clubs because I can’t take part in good stuff like that. Ah very true statement Steve. When Melissa and I were on our honeymoon in Napa and Sonoma, we could have joined 10 clubs. We felt it might be silly, with all of the free tastings that came along with them. We decided on one. While we were getting the Reserve wines at great prices, we were not taking full advantage of everything that they offered, so we did cancel after a year. I know that it’s not just Bedell that this happens to, and I am sure that there are vineyards that don’t even know it’s happening, thier wines drasticly reduced compared to the tasting room’s price. Maybe one day that will be fixed and the prices will be a bit more competitive. Cheers, my friend and keep enjoying local wine no matter what the price is! I also enjoy the First Crush Red and many other of Bedell’s wines. I do agree with everyone’s comments on pricing. I had an experience this weekend which truly blew my mind. I visited Bedell and picked up two bottles of Taste Red at 10% off retail (roughly $32.50 each). Later that night, I went out to dinner on the East End and found Taste Red on the menu for $28. Taking in to account the usual markup, I figured the restaurant must be purchasing the wine for $8-$12 a bottle. I understand that this is a business, but something is wrong when a distributor can sell a wine for 75% off retail.